With plenty of moving services, Meathead Movers is fully prepared to make Cupertino your new home. Our clean-cut student athlete movers are dedicated to fulfilling all your moving needs efficiently. 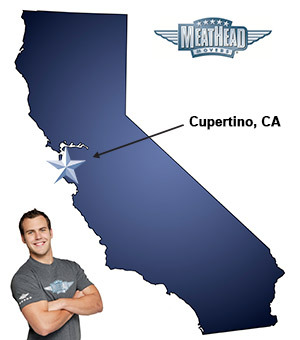 Welcome to Meathead Movers of Cupertino! If you are moving to or from anywhere in Cupertino, we are the moving company for you! Our professionally trained student-athlete movers and our move concierge are here to help you with every stage of your move in Cupertino. With its perfect blend of thriving businesses and peaceful neighborhoods, Cupertino is a great place to live and work. Known as the home to Apple Inc. and many other large tech companies, there are plenty of great tech jobs here. If you are looking for a great place to raise a family, Cupertino is also a great option. With great public schools, a large civic center, and plenty of parks, you are in the perfect environment to raise your family. Our moving company specializes in local, long-distance, and commercial moves to, from, and within Cupertino. We also provide reliable packing, storage, on-site relocations, and our distinctive moving concierge service, which connects you with local service providers. All our student-athlete movers are thoroughly screened and trained before their first move. With branches not just in Cupertino, but all throughout California, we are your one-stop resource for all your moving needs, no matter where your California move takes you. In fact, you can see what your neighbors in Cupertino have to say about us. With our 100% satisfaction guarantee, the only thing you have to lose is the stress that comes from moving! So contact us today for a free no-obligation moving quote and to learn how we can help you on your next move! Moving to Cupertino? Here are some helpful resources. “Every step was very easy from booking all the way through to the end. Extremely professional and friendly staff! I’ve used Meathead before and will do so anytime I need to move. They impressed all the individuals in involved with our rather complex move. We had 3 stops, dropping furniture off at each address. Everything went smoothly and safely! This is the 3rd time we have used Meathead Movers. Once again, these guys were the cream of the crop: courteous, efficient, friendly, helpful, unbelievably careful with our possessions, and they were able to keep our things separate from our daughter's things even though we were moving from the same home to another home together. We would definitely have this same crew again if we ever have the need to move again. Great team! All of the people connected with Meathead Movers were polite, efficient, and helpful along with very careful and more than willing to accomodate our needs/wishes. They made moving so much less stressful than anticipated, and were so respectful of us and our belongings in the process. We plan to recommend Meathead Movers to anyone we know who may be in the process of moving!